The San Jose Jr. Sharks organization is full to the brim. With 29 teams set to take the ice this season ranging in all ages from 8U to 18U AAA, interest in hockey and in the Jr. Sharks has never been higher, as evidenced by the organization’s decision to expand the number of 10U teams for the second consecutive year. Now with four boys teams at the 10U level – two 2006-born teams and two 2007-born teams – the Jr. Sharks are sowing the seeds for organizational success at the ground level. It’s not as though the Jr. 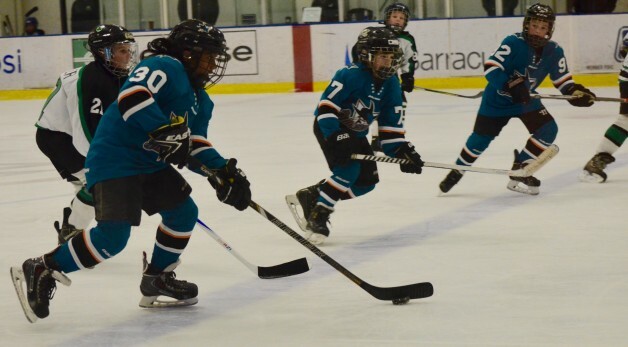 Sharks had to scramble to find players to fill four 10U teams either. Nearly 70 kids arrived to try out for the two 2007-born teams, which meant the organization had to turn away around 30 kids. And it’s not just the boys’ side that’s growing – the girls’ game is just as strong with an 8U team at the youngest age and two 10U teams. With a surge in teams comes an increased demand for coaches within the organization. Janda says while there is always room for more coaches, the bulk of the coaches within the Jr. Sharks are non-parents, something Janda chalks up as a byproduct of the environment parents of hockey players in the Bay Area grew up in. But despite some growing pains here and there, Janda remains confident that the Jr. Sharks are going in the right direction by strengthening their younger age groups. “I think the quality of the product the Jr. Sharks are putting out is getting better every year,” said Janda. “We’re so concentrated on developing skills and fundamentals and what validates what we are doing at the Mite and Squirt levels is what’s happening at the higher levels. This year, we had eight guys from our 18U AAA team move on to junior hockey, and the rest of the kids that age just wanted to go to college where they will play on club teams somewhere.